The incomparable Ernest Tubb ("E.T." to all who knew him) became a legend as much for what he was personally as for the half-century career that stretched from his first radio date in 1932 to his death in 1984. Though other singers with better voices and more raw musical talent have come and gone, none has inspired greater love from fans over six decades. Along with such performers as Jimmie Rodgers, Roy Acuff, Bill Monroe, Hank Williams, Lefty Frizzell, and George Jones, Tubb is country music personified. He was among the first of the honky tonk singers and the first to achieve national recognition. His first recording was "The Passing of Jimmie Rodgers," a tribute to his hero. His long association with Decca began with "Blue Eyed Elaine" in 1940. Three years later his self-penned "Walkin' the Floor Over You," a country classic, was a hit, leading to the Opry, movie roles, and stardom. In 1947 he opened his Nashville record store and began the Midnight Jamboree, which followed the Opry on WSM and advertised the shop while showcasing stars and those on the rise. By that time, he had become one of the most recognizable musical stars in the world, bringing country music to the widest audience it had ever seen. Over the years, Tubb toured widely with his Texas Troubadors, pressing the flesh with fans after shows that featured his many hits, including "Slippin' Around," "Two Glasses Joe," "Tomorrow Never Comes," "Drivin' Nails in My Coffin," "Rainbow at Midnight," "Let's Say Goodbye Like We Said Hello," and "Driftwood on the River." In 1975, after 35 years with Decca/MCA, he was let go, the allegiance of company executives not matching that of his multitude of fans. Because of a lung disease Tubb had to rest in pain on a cot between takes, ending his career just as his hero, Rodgers, had 50 years earlier. Quoting one of his album titles, Tubb left a legend and a legacy. The youngest of five children, Tubb was born in Ellis County, TX, but his farming parents moved across the state to Benjamin when he was six years old. By the time he was in his pre-adolescence, his parents had divorced, and he spent his teens traveling between his two parents, working odd jobs. Early in his adolescence, Tubb was attracted to the music of Rodgers. By his late teens, Tubb had picked up the guitar on the advice of a friend and fellow guitarist named Merwyn Buffington. Following Rodgers' death in May of 1933, Tubb decided that he wanted to pursue a musical career and emulate his idol. He moved to San Antonio, where he again hooked up with Buffington, who was currently playing with the Castleman Brothers on a local radio station. The guitarist convinced his employers to let Tubb sing as a guest vocalist, and soon Ernest had his own regular early-morning show. At this point in his career, Tubb sounded very similar to Rodgers and was still obsessed with his idol. Eventually, he tracked down and met Rodgers' widow, Carrie, and she was quite taken with Tubb, loaning him one of Jimmie's guitars and convincing RCA to sign the young singer. The first singles he recorded were quite similar to Rodgers (including two tributes to the Singing Brakeman), but the records failed to sell and he was quickly dropped from the label. Ernest continued to plow ahead, playing a variety of small clubs and radio stations, without gaining much attention. A major point in Tubb's musical development was the removal of his tonsils in 1939. With his tonsils gone, he could no longer yodel, which meant he developed his own distinctively twangy, nasal singing style. Decca Records agreed to record him in April of 1940, and one of the resulting singles, "Blue Eyed Elaine," became a minor hit. Decca agreed to sign him to a longer contract by the end of the year, by which time he had also had a regular radio show on a Fort Worth station, KGKO, sponsored by the flour company Gold Chain. Early in 1941, he cut several new songs, this time backed by Fay "Smitty" Smith, a staff electric guitarist for KGKO. The first single released from these sessions was "Walking the Floor Over You." Over the next few months, the single became a massive hit, eventually selling over a million copies. "Walking the Floor Over You" was the first honky tonk song, launching not only Tubb's career but also the musical genre itself. Tubb sang the song in the Charles Starrett movie Fighting Buckeroos (1941), which led to another film appearance in Starrett's Ridin' West (1942). By the end of 1942, he was popular enough to gain a release from his Gold Chain contract, and he headed to Nashville. Upon his arrival in January of 1943, he joined the Grand Ole Opry and became the first musician to use an electric guitar in the Opry. Between 1942 and 1944, Tubb made no recordings because of a strike within the recorders' union, yet he continued to tour, often with Pee Wee King and Roy Acuff. Ernest returned to recording in 1944, releasing the number two "Try Me One More Time" early in the year, following by his first number one single, "Soldier's Last Letter," that summer. The two singles kicked off a nearly 15-year streak of virtually uninterrupted Top Ten singles (only four of his 54 singles of that era failed to crack the Top Ten, and even then they made the Top 15). In 1946, he began recording solely with his band, the Texas Troubadors, and he became one of the first country artists to record in Nashville. Between the end of 1945 and the conclusion of 1946, he had a number of huge hits, including "It's Been So Long Darling," "Rainbow at Midnight," "Filipino Baby," and "Drivin' Nails in My Coffin." The singles cemented his reputation in the U.S. and won him new fans around the world. Early in 1947, he opened the Ernest Tubb Record Shop in Nashville, which he promoted through the Midnight Jamboree, a radio program he designed to fill the post-Opry slot on the radio. That year, he became the first country star to play Carnegie Hall in New York, signalling how much he had done to increase country music's popularity across the United States; a few years before, it would have been unthinkable to have such rural music play in such an urban venue. During 1949, he hit the height of his popularity, charting an astonishing 13 hit singles during the course of the year -- which is even more remarkable considering that the chart only had 15 positions each week. Most of those songs were classics, including "Have You Ever Been Lonely? (Have You Ever Been Blue)," "Let's Say Goodbye Like We Said Hello," "I'm Biting My Fingernails and Thinking of You" (a collaboration with the Andrews Sisters), "Slipping Around," and "Blue Christmas." The following year, he had 11 hit singles, including "I Love You Because" and "Throw Your Love My Way," plus several hit duets with Red Foley, including "Tennessee Border No. 2" and the number one "Goodnight Irene." Tubb also demonstrated his influence by helping Hank Snow appear on the Grand Ole Opry and supporting Hank Williams. 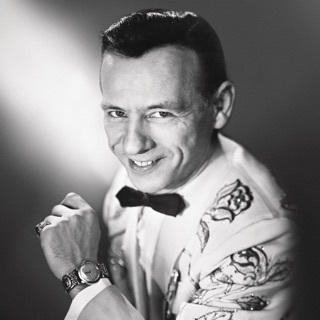 Throughout the '50s, Tubb recorded and toured relentlessly, racking up well over 30 hit singles, the majority of which -- including the classics "Driftwood on the River" (1951) and "The Yellow Rose of Texas" (1955) -- reached the Top Ten. By the end of the decade, his sales dipped slightly, which only meant he wasn't reaching the Top Ten, only the Top 20, with regularity. Nevertheless, he stopped having big hits in the early '60s, as rock & roll and newer, harder honky tonk singers cut into his audience. Even with the decline of his sales, Tubb was able to pack concert halls, and his television show was equally popular. While the quality of his recordings was rather uneven during this time, he still cut a number of classics, including "Thanks a Lot," "Pass the Booze," and "Waltz Across Texas." Beginning in 1964, Decca had him record a series of duets with Loretta Lynn, and over the next five years he made three albums and had four hit singles: "Mr. and Mrs. Used to Be," "Our Hearts Are Holding Hands," "Sweet Thang," and "Who's Gonna Take the Garbage Out." In 1966, Tubb was diagnosed with emphysema and in spite of the doctors' warnings, he continued to tour and record actively into the early '70s. During that time, he continued to rack up a number of minor hits, as well as lifetime achievement awards. In 1965, he became the sixth member to be inducted to the Country Music Hall of Fame. In 1970, he was one of the first artists inducted to the Nashville Songwriters International Hall of Fame. Shortly after receiving the last reward, his hits slowed down drastically -- over the next five years, he only had one minor hit, 1973's "I've Got All the Heartaches I Can Handle." Decca and Tubb parted ways in 1975, and he signed with Pete Drake's First Generation label, where he had one minor hit, "Sometimes I Do," in early 1978. The following year, Drake developed an all-star tribute to Tubb, The Legend and the Legacy, which featured stars like Willie Nelson, Merle Haggard, Chet Atkins, and Charlie Daniels overdubbing their own work on original recordings Ernest had made. Released on Cachet Records, the album produced two minor hits with "Waltz Across Texas" and "Walkin' the Floor Over You" before being pulled from the market due to contractual reasons.